Whether you’re a property owner, car owner or simply cherish those items that make your house a home, protecting yourself against all those eventualities is important to ensure you’ll always sit on your throne. Take the necessary care over your insurable interest to avoid unnecessary small claims that might later result in an increase in premium. Update values; remember that the responsibility lies on you to ensure that you keep your insurer up to date with the values of your items. At King Price we automatically reduce your premium monthly as the value of your care depreciates, ensure that your insurer or broker is doing the same for you. The replacement value of your house contents and all risk items will also change from time to time and this should be updated with your insurer. Your building should be insured for what it costs to rebuild the entire building the way it is. One of the things we’re taught from a young age is to look after our belongings. The same goes for your insured goods, keep them in good working condition and they are less-likely to leave you in the lurch. Regular maintenance of your car will reduce mechanical failures, while having a home safe can keep your precious and valuable items safe at home. We all love getting more for less; bundling your insurance policies together under a single insurer could bring down your monthly premium. For instance, if you insure your chariot (or whatever wheels you use to get around) with king under King Price’s comprehensive cover, you can get the same care for your Apple watch, Nikon camera, golf clubs, bike or even your hearing aid for just R1 a month. Add a second or third vehicle on your policy and qualify for a much lower premium. With the value of your car depreciating monthly, it makes no sense for your car insurance premiums to stay the same. 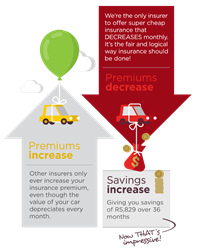 Get reasonably priced insurance premiums that also decrease monthly. This is a sure way of making certain you pay the best premium. Start saving on your peace-of-mind without giving any bit of it up with a tad of planning. For more information to keep your life right-side-up this year, visit King Price’s website.